Any chocolate cake recipe, including one made without gluten like the recipe here, can be modified to use stevia in place of other sweeteners. If you want to avoid refined sugars as well as gluten, rest assured that you can still have your cake and eat it too! 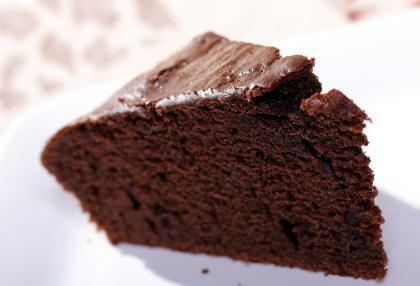 This rich, moist chocolate cake uses a mixture of coconut flour and almond meal as its base. It's sweetened with a combination of liquid and powdered stevia, and it has a decadent chocolate flavor. Beat the eggs with the stevia and almond milk until light in color. Beat in the coconut oil and coffee. In a separate bowl, combine the coconut flour, almond meal, cocoa powder, salt and baking soda. Slowly incorporate the wet ingredients into the dry, mixing well. Pour the mixture into a 9-inch baking pan lined with parchment paper, and bake at 350 degrees for 15 to 20 minutes, or until set in the middle. Combine the ingredients in a medium-sized bowl. Substitute 1/2 teaspoon powdered stevia for 1 cup of sugar. 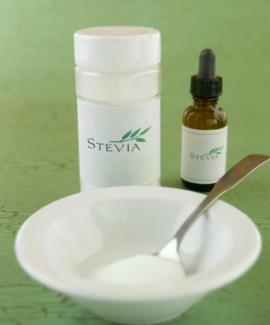 Stevia has a very slight, bitter aftertaste, particularly if you use too much. It combines well with coconut flour, almond meal, and white/sweet rice flour, but garbanzo bean flour, brown rice flour, and soy flour tend to increase the bitterness and should be avoided. Learning to work with stevia can take some time, particularly as you work it into various gluten-free flours. Try this rich, chocolate recipe as your starting point, though, to savor how good gluten-free and sugar-free living can be. Does Subway Have a Gluten-Free Menu? By Erin Coleman, R.D., L.D.